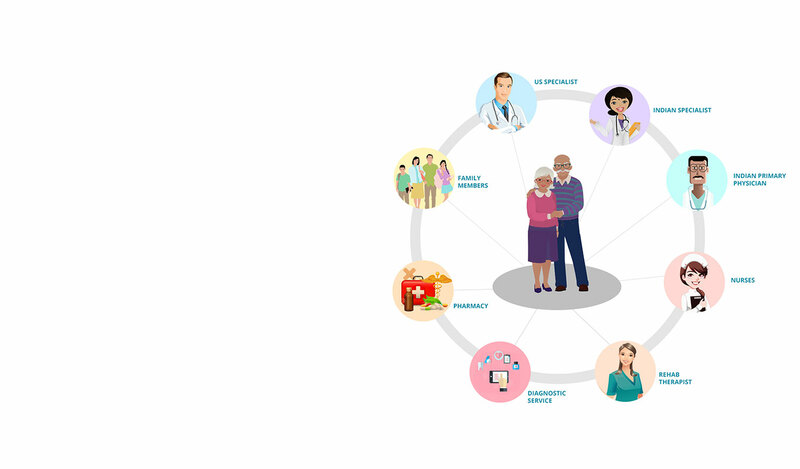 Forever Care™ model focuses on continuous care management and allows family to participate in their parents’ wellness through real-time remote health monitoring and online consulting with care providers. This comprehensive care program combines the services of many professionals working together with state-of-the-art medical care and treatment. Forever Care™ is a fixed-cost annual subscription program paid for by the Indian Diaspora for managing the health of their parents in India. The cost covers diagnostic tests, physician and nurse service at home, rehabilitation and therapy, clinical evaluation as well as patient education by our network of physicians. Click here to see our programs and pricing. Our model requires no paperwork from the patient at any stage. All actions and approval for actions are managed electronically. The entire care process is managed using our technologically advanced clinical and operational workflow. Besides, the information and service is completely portable and many services travel with the patient anywhere in India and outside. The program is setup for the ultimate convenience of the parents in India. The parents need not worry about medical expenses nor do they have to pay at the point of care. We have adopted this model solely with the purpose of reducing stress for elderly patients to obtain medical care. Under this model, physicians, nurses and therapists visit the patient at home to provide care, clinical services and rehabilitation. Appointments are made online or over the phone by calling our support center in India. Our model enables parents or their family to report vitals, health risks and check medication adherence from anywhere and at anytime. UMEDEX Certified medical devices can be used to directly upload several vitals like blood pressure, blood glucose, pulse, oxygen saturation, weight, etc., to our secure cloud. Our built-in Audio/Video and clinical protocols allow parents’ or their family members to report symptoms like fever, chest pain, etc. from the comfort of their home and receive feedback and action plan from our network of physicians. Technology is at the heart of our model. To maximize patient convenience, UMEDEX, for the first time ever, launched the integrated diagnostics network spanning several cities in India. All activities are managed electronically. The patient is neither required to complete any paperwork, nor carry any reports, films or CDs. Our care model takes patient comfort to the next level. It allows patients to have their medicines shipped right to their home - or anywhere else they choose. Prescriptions or refill requests are sent electronically to our affiliated retail pharmacy network in India that delivers medication to the patient’s home. On an ongoing basis, physicians and family members can remotely monitor adherence and track the medication’s effect on patient’s vitals, symptoms and clinical conditions. Continuous education and counseling about patient’s condition is an integral part of our care model. Physician-moderated group education and counseling is available to the patient every quarter. In addition, one-on-one private counseling is available during scheduled physician and nurse visits. The UMEDEX communication engine is the backbone of this model. It handles all types of interactions between caregivers, patient and their family members - messaging, alerts, discussion, tracking, remote monitoring, and video / audio streaming, to name just a few. Our advanced and secure communication engine spans web and mobile devices.